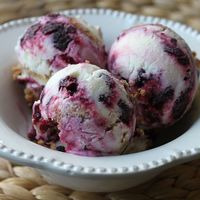 This tastes so close to the homemade blueberry cheesecake ice cream I made the other month. Only difference is that ice cream had alcohol in it! This is definitely creamy and tastes like cheesecake ice cream with a ribbon of thick blueberry sauce and fresh blueberries mixed in. Delicious! At S&V you mostly get blueberries with some cream. It will require a steep to allow all the cream based flavors to homogenize and really come out and shine, while also converting the blueberries to a more subdued compote/thick sauce style. This combo makes a great blueberry sauce. The Forest Fruit is not quite a blueberry but it does have blueberries in it. Its fresh and ripe without being overly tart. The Bilberry adds that slightly tart element while also bending it more towards the blueberry realm instead of the "berries" category. The Blueberry Extra converts the blend into the more syrupy, thick and sweet sauce I am looking for. FA Custard has a citrus note to it which pairs nicely with the sweetness of the blueberries. It also does a great job of backing up the LB Vanilla Ice Cream which can mute flavors in higher %'s. Plus custard is a very common base for actual ice cream. I chose LB Vanilla Ice Cream because its a great ice cream and it doesn't give anyone the pepper taste. This is the cheesecake base. CAP New York Cheesecake is a fairly authentic cheesecake after a good steep. I have the OOO Cream Milky Undertone in here to really help make the mouthfeel creamy like this ice cream should be. The CAP Vanilla Whipped Cream is great for mouth feel as well, however I am also using it to bump up the vanilla note a little. This is a really delicious molten blueberry ice cream. I was skeptical about the forest fruit (it usually reminds me of a back of gummy bears), but it really blends in well and boosts the blueberry. Great job! Thanks for sharing!